2009 has seen the world economy crumble due to the unethical practices of businessmen and corporate oligarchy. 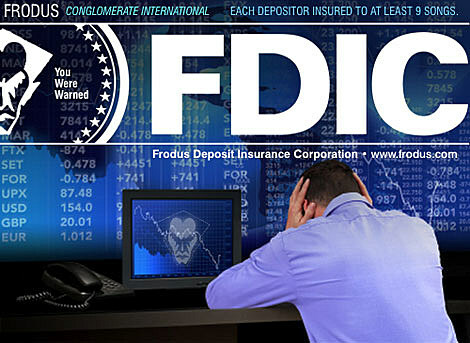 The current administration with the assistance of Ben Bernanke, Chairman of the United States Federal Reserve, has reached out to the Frodus Conglomerate International for aid. Calls were made, doors were closed and numbers adjusted. After weeks of vicious negotiation both parties agreed on a proper course of action. The Frodus Conglomerate International will address the public for the first time in 10 years on Saturday March 21st, 2009 at 4:35 pm in Austin, Texas. Austin will be the first of several public forums to address current global conditions forewarned by the FCI in years past. The Conglomerate has employed Liam Wilson of the Dillinger Escape Plan to supply bass guitar for this address while Nathan Burke organizes his North-West Contingency. We are the economic police. I couldn’t resist… I had to rock that whole quote. That’s right… Frodus is BACK and playing SXSW as part of Slip Productions and Lovitt Records day party at The Radio Room on March 21st with Cursive, Young Widows, The Van Pelt (who are reuniting), Des Ark, Milemarker, Pygmy Lush, and a boatload of others. Full details are below and MP3s of some of the participants are above. Frodus recently reissued their 1998 album Conglomerate International on 2LP mastered at 45RPM. Limited to 600. Um, get on that. Shelby Cinca of Frodus was recently interviewed on Dissonance Radio. Download that podcast here. 11:30 – Head of Skulls! This is a free show but there will be a suggested donation of $10 at the door. SXSW badges will not get you in. If you want to be on the paid reserve list, you can go ahead and pay pal $10 to: crcooper@usa.com. Those who do this will get a show poster and some other goodies. Thank you for your support!